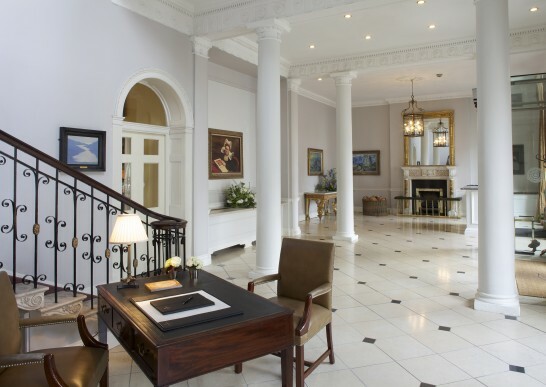 Dublin’s most stylish and luxurious five star hotel, The Merrion is located in the city center opposite Government Buildings. Created from four restored Georgian Townhouses, many of the 142 bedrooms and suites overlook period landscaped gardens. Remembered historically as the birthplace of the first Duke of Wellington, the hotel houses one of Ireland’s most impressive collections of art and antiques. Guests can choose to dine in The Cellar Restaurant, which offers simple Irish cuisine expertly executed while Restaurant Patrick Guilbaud, with its 2 Michelin stars, offers more formal gourmet dining. Bars include The Cellar Bar set in the original 18th Century wine vaults and the intimate cocktail bar, No 23. During the spring and summer months, guests can relax out on the Garden Terrace while the Drawing Rooms, with their open log fires, are perfect for Afternoon Tea any time of year. The award winning Tethra Spa boasts an 18m pool, steam room, fully equipped gymnasium and private treatment rooms. The Merrion offers six of the most impressive rooms available in Dublin for high-level business meetings or private dining. Located in the former home of the 1st Duke of Wellington, these rooms can hold up to 100 people for a reception or 50 people for private dinner or meeting. These splendid rooms offer their own separate entrance, natural daylight, ornate ceilings, large sash windows and both broadband and wireless internet connections. Here, you will find a perfect harmony of 21st century technology with 18th century luxury to create a unique corporate setting.